Mixed Media/(puppet) 159 cm(installation) 513.6(L)x364(W)x431.8(H) cm/2011/Produced by ETAT Lab. 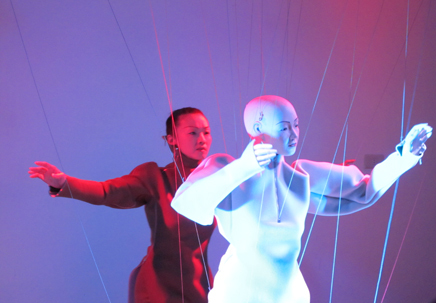 Project Anne Huang is an original interactive performance between a mechanical puppet and humans; digitally manipulated and moving with grace and beauty, the puppet encounters the human in real life. 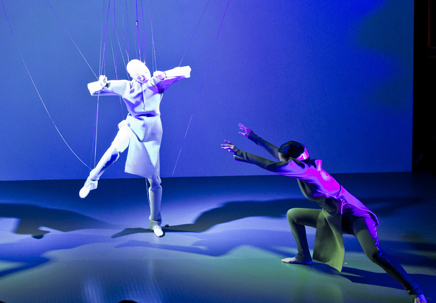 The immediacy of technology and passivity of a traditional puppet would conflict or agree, and therefore, in interacting with the reality, start a dialogue between the virtual and the real. Layers of (anti) simulation and (re)positioning between puppets, humans and technology articulate further how this power of control effects changes in the external environment. 2011 Center for Art and Technology ,TNUA, All Rights Reserved.